Boil rice to readiness, salt, wash it. Fry omelet, let it cool, wrap in tube, cut along in thin strips. Cut salmon in thin slices. For cheese sauce, grate cheese in bowl, add some milk, and turmeric for color, heat over medium heat, constantly whisking. We should get smooth sauce. Regulate consistency with milk. Heat tortilla for 30 sec in microwave, and after it becomes soft and pliable. Pour some cheese sauce on tortilla, spread rice with omelet, leave of lettuce, salmon, pour cheese sauce agin, wrap in roll, and bake in a contact grill. If you do not have it, then dry in grill skillet. 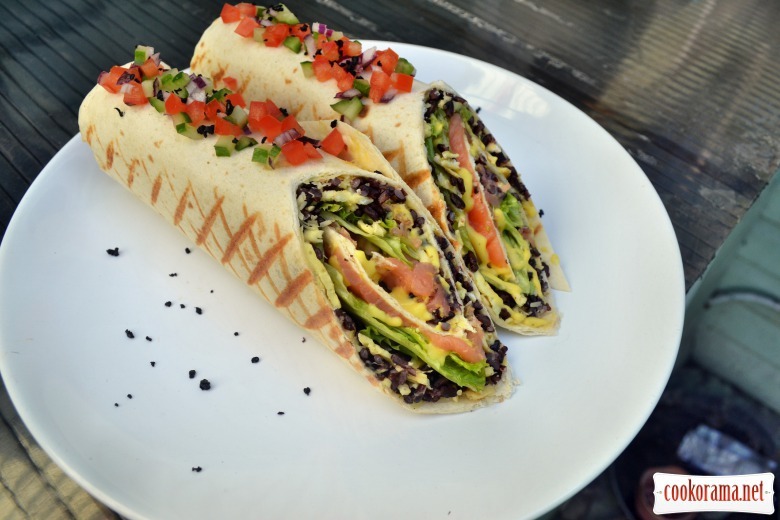 Top of recipe "Roll from tortilla, with rice, omelet and salmon"